NEWARK, New Jersey -- A video posted to social media sparked an animal cruelty investigation in New Jersey. Police say the video shows a 19-year-old throwing a cat from a third floor balcony in Newark. Now, that teen is facing charges. In the video, you can hear laughing as the helpless cat is tossed like garbage. Once the video was posted to Instagram, it prompted an outcry. Yasmin Rivera, who goes by @Jazzyxoxo13 on Instagram, rescues cats, and raced to help this one. Amazingly, the tabby cat survived and is now receiving veterinary care. Authorities believe the sick act happened last Thursday. By Sunday, they arrested Tikeemah Lassiter from Clinton, New Jersey. Officials believe the teen was visiting relatives in Newark when she allegedly tossed the cat off of the building. Apparently she was not hard to find after the video was posted all over the internet. 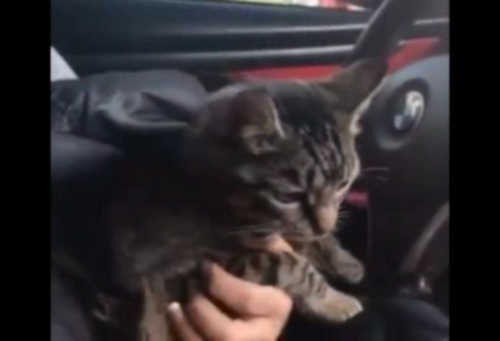 As for the cat with multiple lives, Eyewitness News is told investigators did compare the cat Rivera retrieved with the cat in the video, and confirmed it was the same cat.